There’s always an inherent issue with bands releasing albums at this point in the year. About now, when end-of-year lists are in full swing with so much throughout the year to take into consideration, anything released now will simply be ignored due to time constraints. Usually that’s not too much of a problem – on average, very little is released at the tail end of the year that’s really worth worrying about – but for an album like Baroness’ Purple for example, breaching any self-imposed cut-off dates can mean a fantastic album doesn’t get the attention it deserves. But at least Baroness already have some clout; for Felix Hagan & The Family, they’re essentially starting out as virtual unknowns, pushing against the current to get their debut album Attention Seeker on the radar. Sure, there might be a couple of connections to Frank Turner with Hagan himself serving a brief fill-in stint as a member of The Sleeping Souls, but apart from that, Attention Seeker has its odds well and truly stacked against it. And that’s a real shame too, considering that’s the only real fault this album has; in itself, Attention Seeker is a totally riotous listen, pitched somewhere between Frank Turner and Queen by combining the whip-smart populism of the former with the unashamed camp and flamboyance of the latter, and channeling them into a series of huge, glittery anthems. It mightn’t be the deepest or most pervasive album, but when Felix Hagan & The Family have such a tight grip on how to make music as fun as this, that’s as much of a non-issue as it’s possible to get. Most of that comes from the fact that, most of the time, the band completely shun any darker tones or themes in favour of blaring, uplifting melodrama in every move they make. The theatricality is brought right to the front here, from the rousing, folk-touched stomp of the opening title track, to the slow-burning, Coldplay-meets-Queen duo of Fall Away and Burn Down This City, to Gene Kelly, which doesn’t even try to hide how much of a show-tune it clearly wants to be in a near-perfect shot of undiluted euphoria. The energy on this album is staggering at points, and yet even on the hundred-miles-an-hour rockabilly of Hey I Want You where it reaches its peak, there’s a level of composure maintained that’s a testament to how well-constructed this album is. For a band with seven members, that’s no mean feat either, but Attention Seeker thrives on the equal contributions of each for its overall huge sound. Hagan is pushed right to the front as the perpetual source of momentum, but Ellie Cowan and Tash Hodgson provide a much greater role than just backing vocalists, fleshing out the overall sound and acting as a great counterpoint on tracks like Hey I Want You and Be A Freak. As for the rest of the instrumentation, there was always going to be a certain amount of diversity with so many hands in the pot, and Attention Seeker doesn’t disappoint in that regard. For the myriad of genres touched on here – pop-rock, dance-punk, electro-pop and at least half a dozen more – it never feels slapdash in how they all fit together (even if the jerky On The Double is probably done the least well), and with the constant explosions of animated colour and vibrancy, that acts as a surprisingly sturdy through-line. Of course, lyrically Felix Hagan & The Family embrace the sort of themes that would benefit the most from this unashamedly broad canvas, and with a great focus on lively upheaval, Attention Seeker’s nexus between the two is ultimately as convincing as it gets. The fervent desires to leave a legacy on Gene Kelly is perhaps the most full example, paired with big power chords and its glitzy, oversized hook, but The World’s Yours and Be A Freak yield similarly excellent results in the call to arms to embrace one’s individuality and make something of it, and on the title track and Hey I Want You which take a more relationship-oriented path, they’re clearly portrayed as wild flings rather than anything really substantial, and for the breathless pace of each, that does work. But really, whatever single factor of this album is focused on, the whole thing circles back to the mood, and how Felix Hagan & The Family can craft such an effortless good time in their embrace of both pop-rock bombast and copious amounts of theatrical glamour. There are few bands around doing this sort of thing with the glimmer that this band bring, especially with the inflated sense of thrill that Attention Seeker brings and how they make such stellar use of it. This is an album that well and truly makes itself known, and that alone is enough of a reason to take notice. 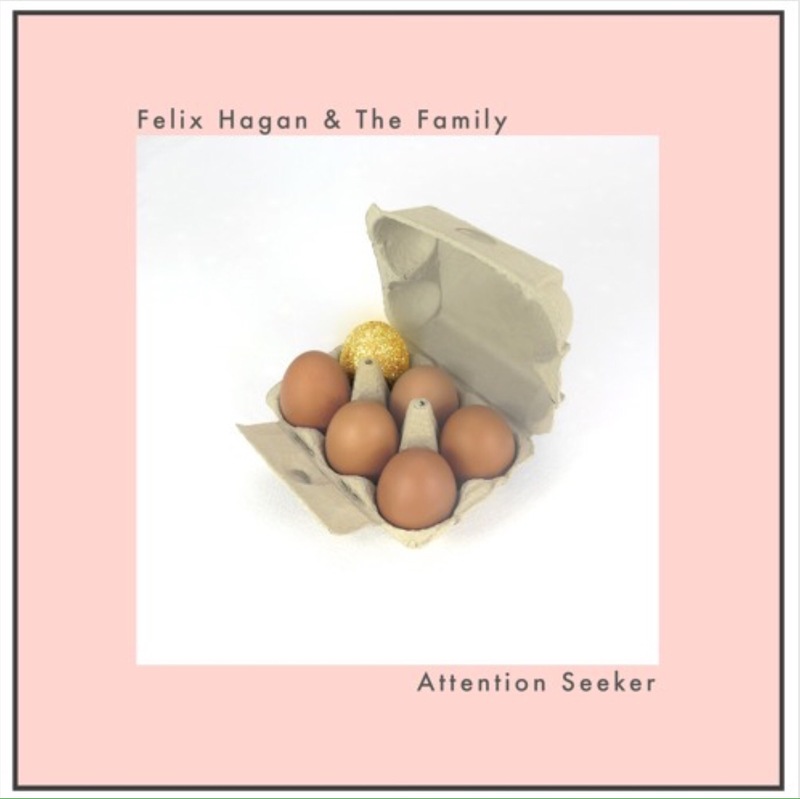 ‘Attention Seeker’ by Felix Hagan & The Family is out now.